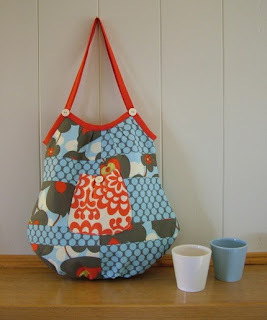 What to do with vintage fabric? 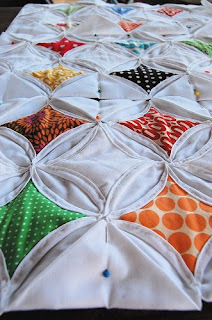 Here is also a cathedral quilt tutorial via "CRAFT". Beautiful! Chickadees have a very special place in my heart because I have only a few memories of my Mamaw Bernice (or as I affectionately called her, "Mamaw Moose" because I was obsessed with Mickey Mouse and couldn't say, "mouse"). One very clear memory I have of her is going to stay and sleeping in the guest room. She always put my favorite sheets on the bed, which were a very retro scene of chickadees on a mint green background of branches and tiny blue flowers. We would play a game of "find the chickadees" before I went to sleep. Here are some beauties that I spotted today in the world of handmade...if you've never spent an hour looking through etsy shops, go be inspired today! 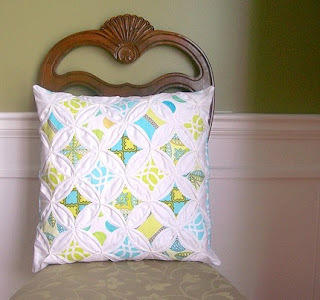 This cathedral quilted pillow is gorgeous from warmnfuzzies.etsy.com I love, love the colors! 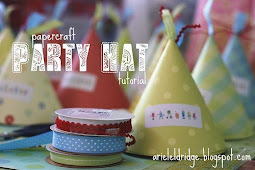 I *heart* giveaways BIG time, especially when they're handmade!!! 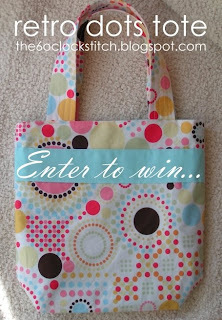 Here is a link to the6oclockstitch.blogspot.com to enter for a chance to win a super cute polka dot fabric tote! I'm new to this whole realm of quilting, but I've learned quite a lot in a short period of time. Here's a fabric buying tip if you live in the south Indy area... 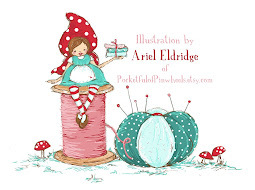 I found a great fabric and yarn shop this weekend that I never knew was in Franklin. If you're looking for the best and brightest fabrics with a modern twist, visit "Clementine's Dry Goods" on Water Street in historic downtown Franklin, Indiana. The owner is very friendly and passionate about color. I felt immediately more comfortable than when I visited another quilt shop in the area. As a first-time quilter, I didn't want to be intimidated by women who "know-it-all", if you catch my drift. I had a great experience at Clementine's, so I definitely recommend the trip whether you're a sewing pro or novice! I heard a tip for pre-washing your fabrics, that if you snip a small diagonal across the corners, it keeps them from fraying terribly in the wash.
My final Monday thought is on free-motion quilting. 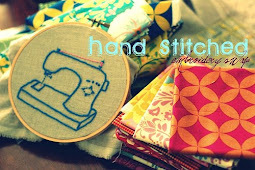 I would love to learn to stipple quilts, using my good 'ol Janome 405 sewing machine. I've done a little research, and found that I need a darning foot accessory for my machine but haven't seen it in action. 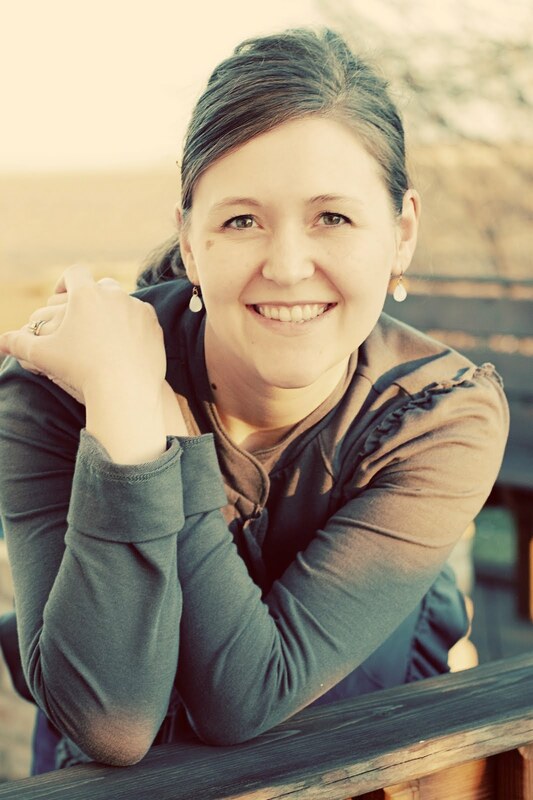 If you're reading and have some advice on the matter, I'd love to hear your comments. Okay, I'm a fan of ways to support the cause of Breast Cancer Awareness in a humorous way. 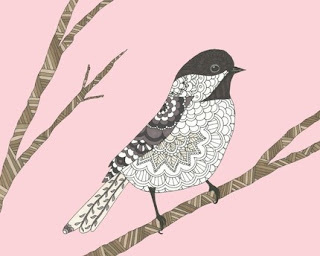 My momma is a breast cancer survivor and it goes way beyond the pink ribbon...here is a link to a group of quilters in South Carolina, who "supported" the cause in a humorous and unique way. *Heads up* There are bras involved, so you may want to look when your 8 yr. old son isn't peeking over your shoulder ;) Take a look Here. Write your message or signature with a micron permanent pen. I found mine at Jo-Ann Fabric store in the quilting notions section. I thought it would be in the art supplies aisle, but they sell it near the quilters' square rulers, pins, etc. It comes packaged as a single marker. The "01" tip worked well for me and didn't bleed, as long as I didn't go back over what I had already written. I then stitched the label to the back of my quilt, using the same stitch as I would the binding. It shows a little, so you may want to use thread to match the quilt backing. Just be careful not to stitch your needle all the way through to the quilt top...just catch a few threads from the backing fabric and it should be secure. This looks so personal and your friends and family will love to have your handwriting on the tag! It's day 9 of one of the nastiest colds I've had in awhile. Titus is feeling better and acting better, but his nose still runs and his cough isn't completely gone. We're still "un-Gymboree" worthy at this point and had to miss our class again this week. I called to let them know we were still alive, since we've missed 4 weeks in a row due to snow and illness. In the meantime, I'm keeping busy. Laundry needs to be done and there are lots of projects in my head. We are one step closer to redecorating Titus' nursery...we bought the paint last night and I'm planning to prime tonight. I'm a horrible mom because I've painted everyone else's nurseries, but my kid got the ugly cocoa color that was once my office. I'll show before and after pics when it's done. Our dining room table is in shambles, hiding under a pile of fabric scraps and plans. These scraps are leftover from a camera strap I made as a birthday gift for a friend...I think they will make a cute patchwork lovey. I'm also still in need of a pincushion. Here are the plans for my next quilt...the plan is to have it finished by March 22nd...my momma's b-day. She's turning the big 5-5 this year, so I want to give her something special. 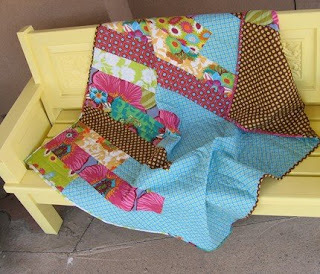 She has always said that she and my mamaw loved goldfinches, and her favorite colors are bright lemongrass greens and turquoise, so I think these fabrics by Heather Bailey and Alexander Henry will look great together...now I need to decide on the quilt pattern!! Here is my FIRST QUILT! Woot woot! My best North Carolina Buddy was having some trouble finding the "right" bedding for her newest little "Brady"...I thought, "I can do that!" Sure! 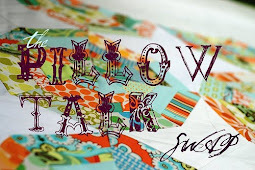 And it turned out that quilting is so much easier than I thought...especially with lots of advice from my friend, Jen, some inspirational "eye candy" from some etsy professionals, and a few good 'ol YouTube video tutorials! I'm not quite finished hand quilting within the squares and attaching the binding, but it's really coming along!